A little dark -- I didn't see the hat at first. This must be very significant to the photographer and it's a lovely shot. Could be interpreted in many ways. 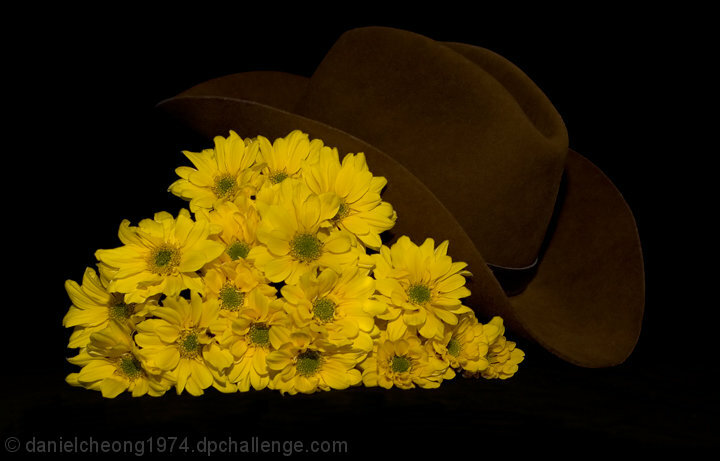 The hat hidden, overshadowed by the flowers of his passing. The hat is very much lost in shadows here. Some more lighting back there would help a lot, and also put some interesting highlights onto the flowers. Wow. This is a sad photo. Sad in an emotive way - not quality-wise. Lighting does seem a bit dark and the hat gets lost in the bg. Nice shot and a great concept. I'd like to see a bit more light on the hat but thats tough with the flowers. Perhaps a white background so the hat stands out more. Proudly hosted by Sargasso Networks. Current Server Time: 04/24/2019 09:51:56 AM EDT.